“You’re a heli-huddle virgin, I can tell,” laughs veteran mountain guide John Mellis, who catches my nervous twitch as I and nine other hikers crouch shoulder-to-shoulder within a couple metres of the roaring Bell 212 helicopter, its rotors cutting the alpine air above our heads and kicking up dust into our squinting eyes. 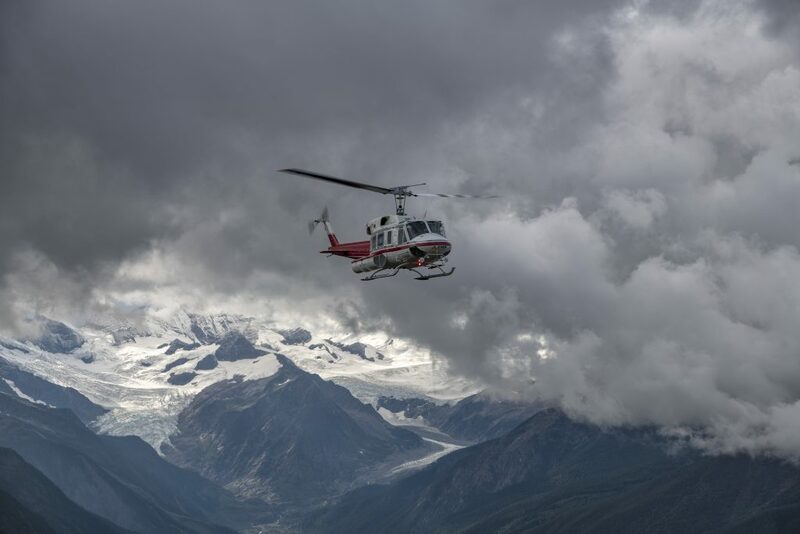 The deafening engine and flying dust are at odds with the peaceful mountain scenery that surrounds the helipad at Cariboos Lodge, a remote luxury property located on the southern banks of the Canoe River, about 25 kilometres west of Valemount, B.C. 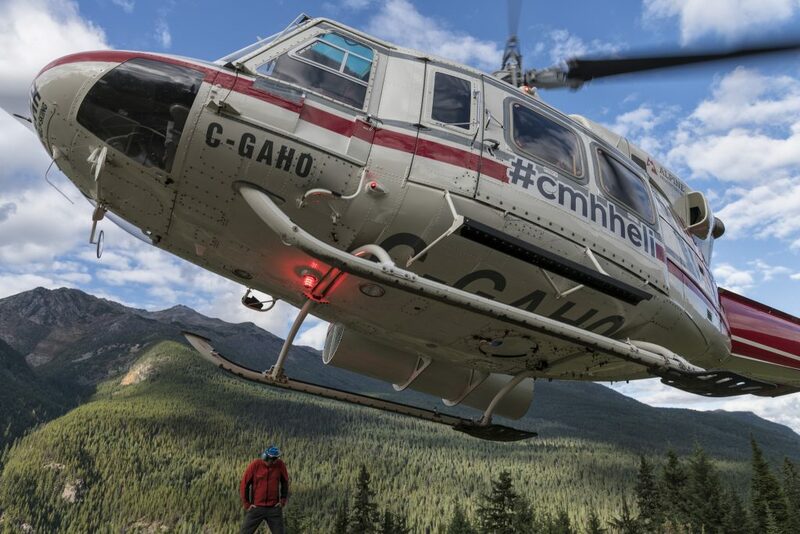 The lodge is one of several operated by CMH Heli-Skiing & Summer Adventures, which is relaunching its summer heli-hiking program in 2018. I’m here for a test hike. Mellis, who is also the area manager for Cariboos Lodge, reiterates the safety instructions he and pilot Jens Gessner shared with our group at the breakfast table that morning. The closer you are to the helicopter, the safer you are. The tips of the wings can dip down, especially on uneven ground — trust me, you don’t want to be there. Stay away from the rear of the helicopter and always approach the aircraft in a crouching position — and hang onto your hat. If your toque goes flying, let it fly. Do not run after it.” At which point my favourite toque goes flying. I do not run after it. 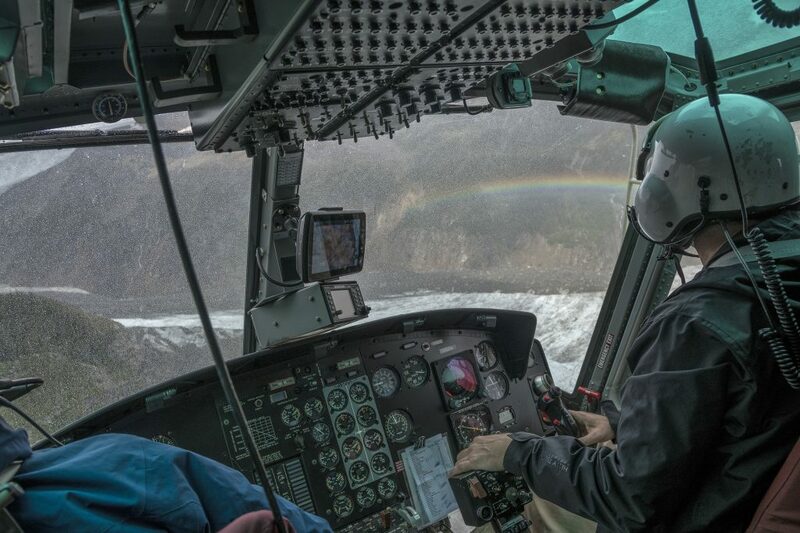 A rainbow is visible outside the helicopter window as the pilot navigates through a snow shower. 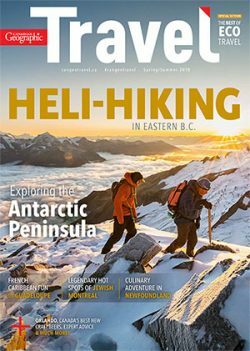 We’re about to fly into the Premier Range, a group of mountains in east-central British Columbia that are part of the Cariboo Mountains range, which itself forms the northern end of the Columbia Mountains and contains some of the highest and seldomest-seen — much less hiked — peaks in the country. 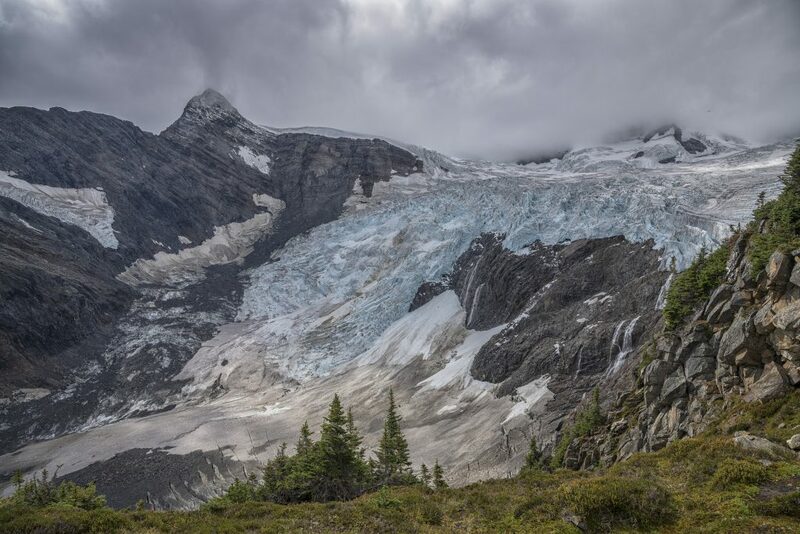 Bounded by the Fraser, Thompson and Raush rivers, many of the Premier Range’s mountains that are more than 3,048 metres high are named in honour of late Canadian prime ministers (Mount Sir Wilfrid Laurier, at 3,516 metres, is the highest), but you don’t think politics when you’re here — you think playground. 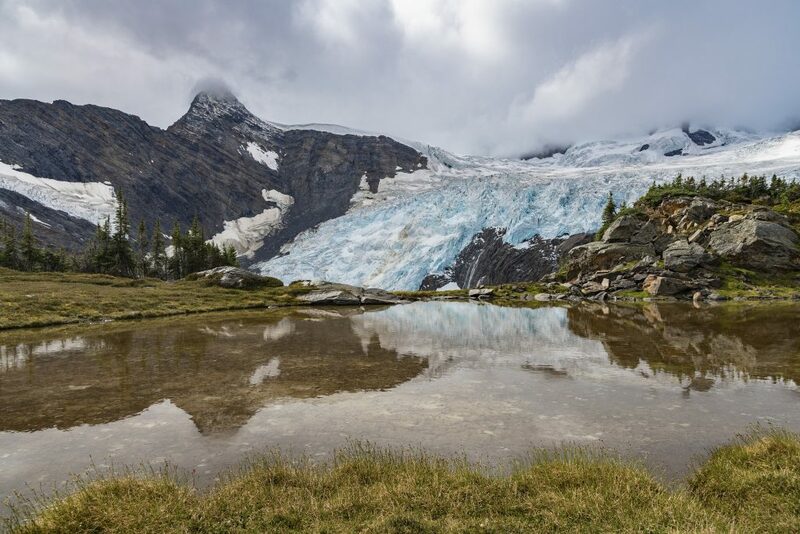 With towering spires of ice and rock, mammoth glaciers, snow-covered mountains, rolling meadows, pristine alpine lakes and waterfalls spilling from 1,000-metre-high cliffs, the Cariboo and Premier ranges are a backcountry hiker’s dream destination. And getting to them by helicopter is an experience like no other, as Mellis reminds us. 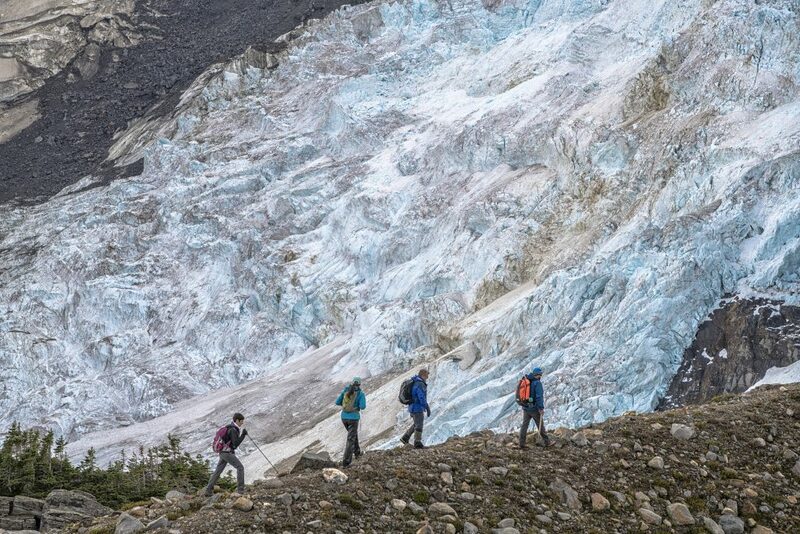 Guide John Mellis leads a group of hikers past the Zillmer Glacier in an area known as Upper Zillmer. The helicopter deposits hikers atop the mountain. 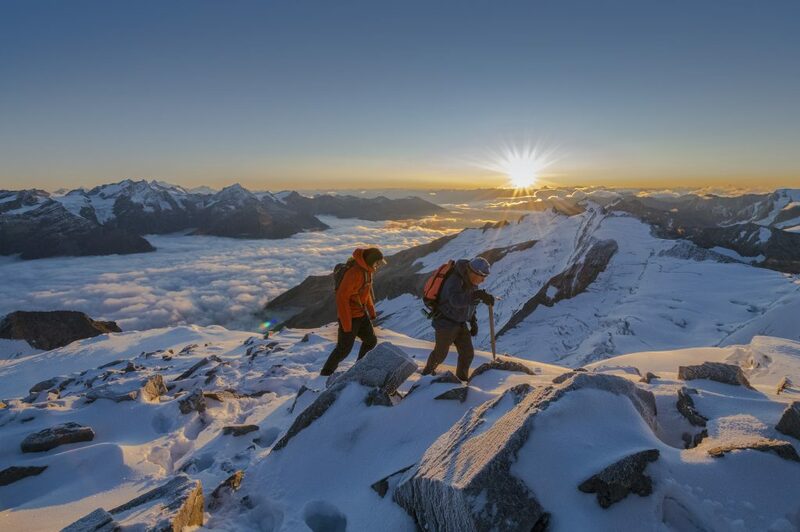 The sun appears over the horizon as two hikers summit a peak in the Cariboos. 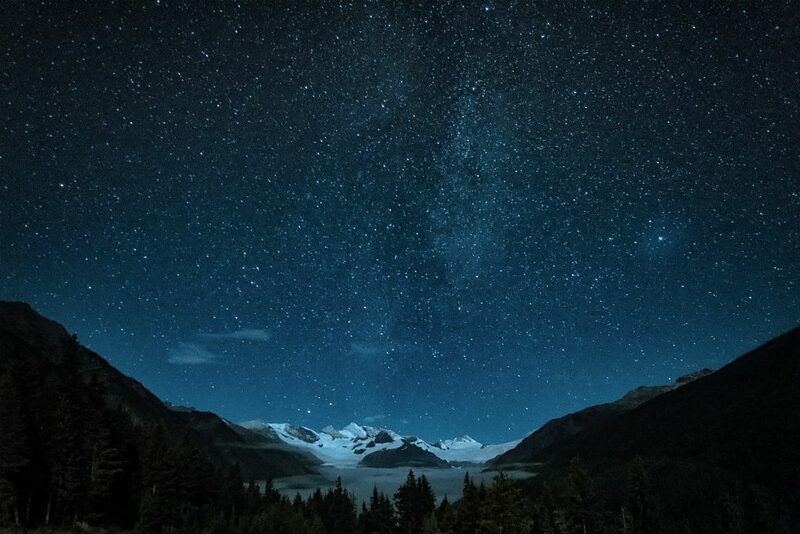 Brilliant stars over the North Canoe Glacier, as seen from the CMH Cariboos Lodge. Mellis, riding shotgun in the cockpit beside Gessner, suddenly points directly ahead: North Canoe Glacier. It’s colossal. Our flying fishbowl of hikers morphs into a crew of high-altitude paparazzi. We’re so in awe of the towering formation in front of us that we don’t notice Gessner has started to descend. 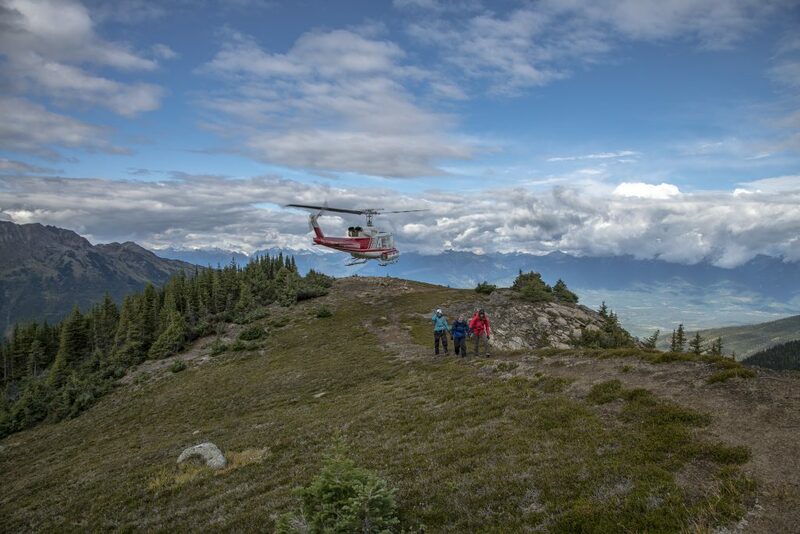 There’s nothing like your first mountain drop-off to appreciate the skill of a helicopter pilot as they land a bulky machine on an area the size of a condo balcony. Gessner deposits us on a boulder-strewn ledge called the Ninth Hole, a scraggly mess of moss-covered schist rock and quartz overlooking the striated glacier. 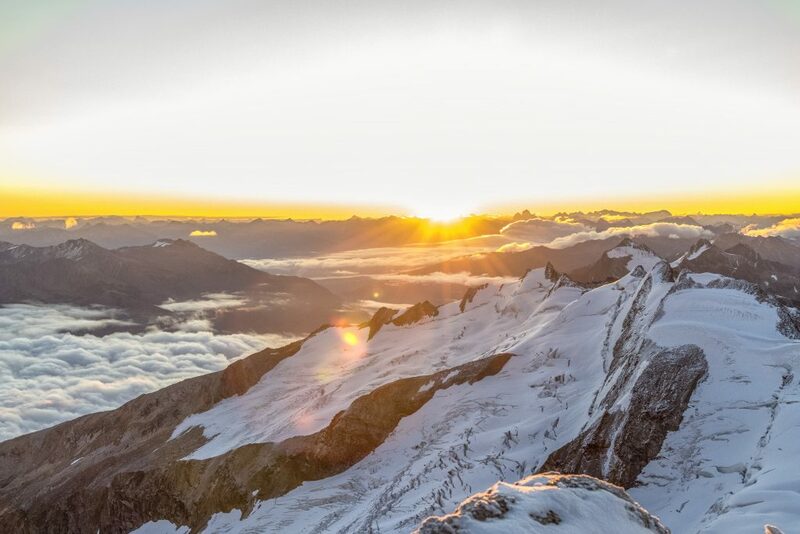 Just across the expanse of ice and rock is Little Matterhorn peak, which Mellis estimates to be about 2,500 metres high. There are no trail markers in this wilderness setting, so we put our trust in Mellis, who follows his instinct and his memories, formed during almost 25 years of hiking and skiing throughout the Cariboos. We trek up an incline, skipping over rocks and puddles, then angle westward through a meadow splashed with red, yellow, purple and white alpine flowers. It’s difficult to concentrate on where I’m putting my feet when there’s so much to look at. In the distance, I can see the snow-capped peaks of Mount Carpé and Mount Withers. 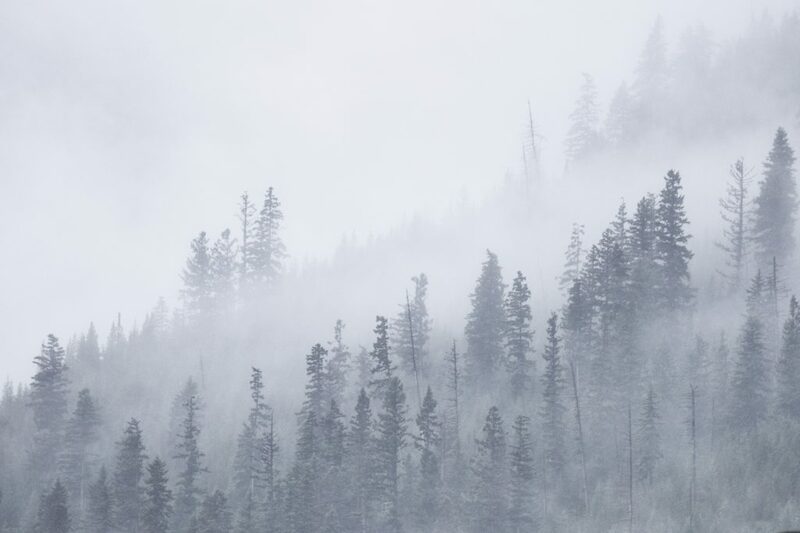 Morning mist in the Cariboos. 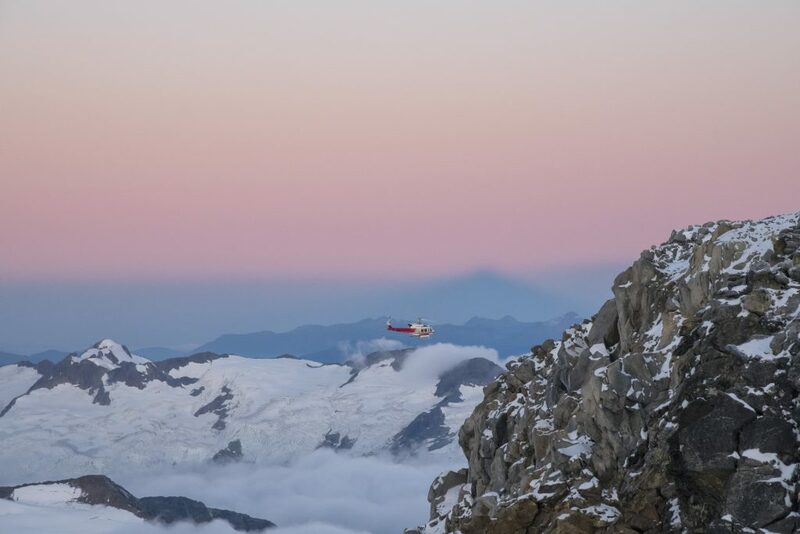 The following day we’re treated to a series of heli-bumps — quick, 15-minute rides that lift us from peak to peak. At Zillmer Canyon, also known as the Tropics of the Cariboos, the views are spectacular. About 500 metres below our makeshift landing pad is the turquoise water of Zillmer Creek; in another direction, a series of nameless waterfalls adorn sheer cliffs. There are jagged ridgelines, huge outcrops of quartz and alpine meadows thick with heather. But Mellis is eager to show us something he has not seen, or hiked on, in almost 10 years: The Adventure Trail. The steep route is only a few kilometres long, but part of it involves climbing a smooth rock face that most of us are only able to scale because of the metal rungs Mellis pounded into the granite 15 years ago. It’s a workout, but it’s also thrilling to know that I’m walking where no human has set foot in a decade. Not bad for a day’s hike.